The concept “religionless Christianity” has become closely associated with the name of Dietrich Bonhoeffer. On pp. 465-468, Metaxas shows how many have hijacked this phrase to make Bonhoeffer a prophet of their own movement or agenda, in a way that is inconsistent with Bonhoeffer’s theological intentions. First of all, the phrase occurs only in his 1944 letters to Eberhard Bethge, not in any of his published works. Bethge was his closest friend and (what we would call) “accountability partner.” These were private and intimate letters, not intended for wide readership, and very incomplete. We should be cautious in drawing conclusions about Bonhoeffer’s theology as a whole from such sources. None of us would appreciate our theology being pieced together from a few private emails. In addition, this concept should be interpreted within the context of the rest of his life and writings. Claims of radical discontinuity in a person’s thought are rarely accurate, and the burden of proof is on those who would advance them. Bonhoeffer had been fighting all his life against the anemic German “Christianity” which had capitulated to Nazism. He lived in a nation and continent with a rich Christian heritage and culture, but that heritage and culture had lost its vitality and prophetic voice – and that situation was the context for all Bonhoeffer’s thinking. Hence his criticisms of “cheap grace,” his call for radical monastic community, and his concern in Ethics that traditional morality and “religion” were insufficient for generating true obedience to God. 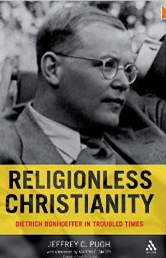 Thus its quite natural to see Bonhoeffer’s musings about “religionless Christianity” as an extension of his earlier theology, namely, as a critique of watered-down Christian culture which has retained the husk of Christianity but lost the vital core. In other words, there is no need to posit a last minute conversion to a “God is dead” theology, or some other bizarre turn. What Bonhoeffer was saying with this phrase is really what he had been saying all along. Bethge in a 1967 lecture: “the isolated use and handing down of the famous term ‘religionless Christianity’ has made Bonhoeffer the champion of an undialectical shallow modernism which obscures all that he wanted to tell us about the living God” (466).